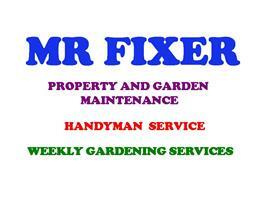 Mr Fixer Ltd - Garden Services, Home Improvements based in Aldershot, Hampshire. Fencing, Hedge cutting, Lawn mowing, Weeding, Paving, Patios, Paths, Sheds, Clearance, Leaf blowing, House / Shed / Fence Painting, etc. Weekly Gardening Service Available.